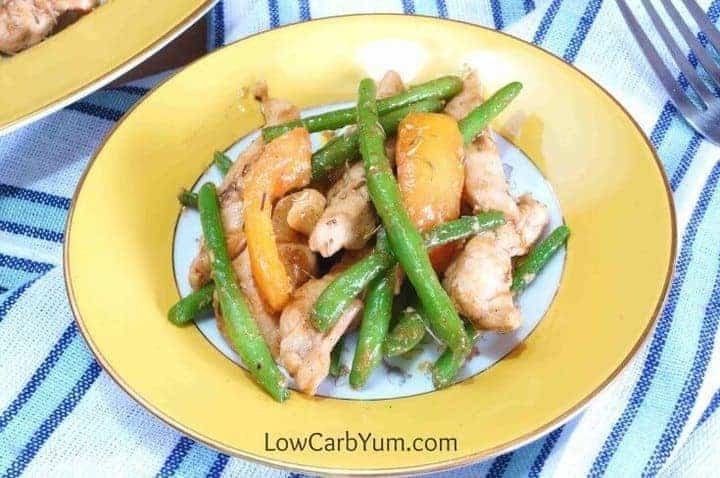 A wonderful chicken green bean stir fry that cooks up fast in a skillet. 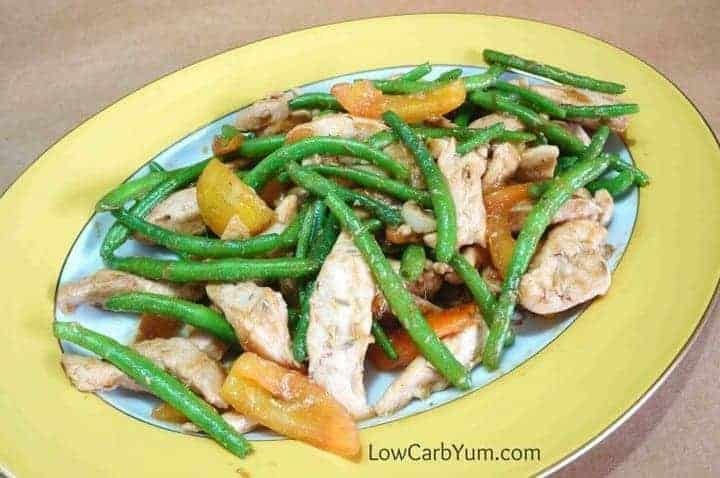 This quick and easy chicken dish makes a healthy low carb meal. 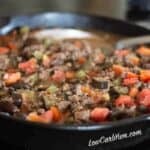 I love one skillet dishes that combine meat and vegetables. 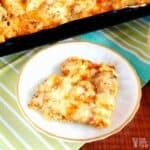 This chicken skillet dish is quick and easy. It’s something I make on the fly. I work 10 hour days so I rarely cook a meal that requires a lot of preparation on work nights. 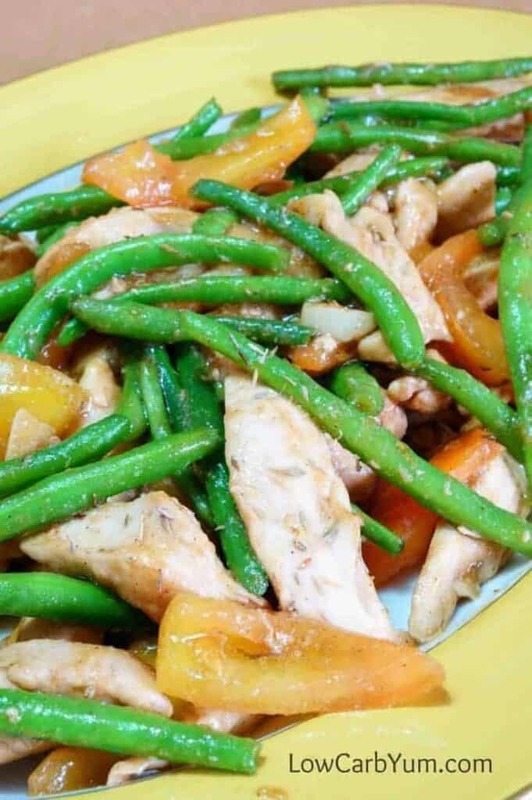 This chicken green bean stir fry recipe gets dinner on the the table fast! We are still getting tomatoes out of the garden. I prefer using them fresh rather than canned or frozen. This was an easy dinner for me to put together after work and use up those garden tomatoes. You don’t have to use fresh tomatoes or green beans in this dish. 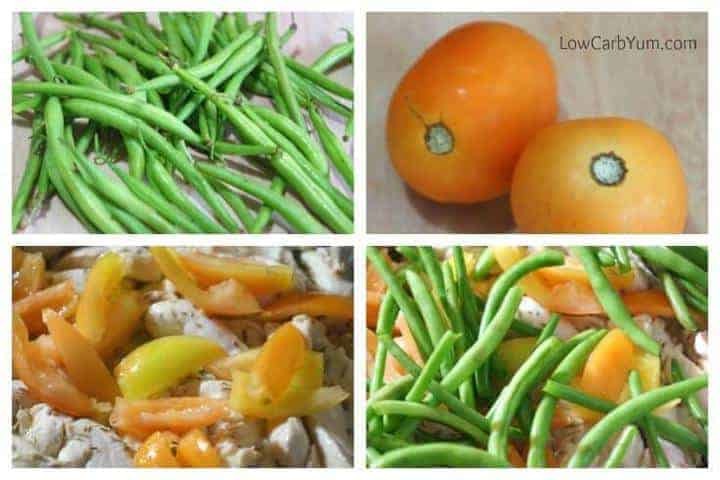 Canned green beans and or tomatoes work just as well. I also like to keep frozen green beans in the freezer to use when I don’t have fresh produce on hand. Using canned or frozen green beans saves time because you don’t have to clip off the ends. It’s a good idea to keep a good supply of canned and frozen low carb veggies at home. Although you can stir fry the chicken and vegetables in olive or avocado oil, I like the flavor that results when cooking in butter. I don’t always use butter in this chicken green been stir fry recipe, though. And, I don’t recommend using a seed oil. I grew up on simple dishes like this one. My father was the cook and he’d often make a quick stir fry with meat and vegetables to serve with rice. These days, I don’t bother with rice. But, when I have time, I’ll make up a big batch of easy cauliflower rice and freeze in single servings to go with dinner. 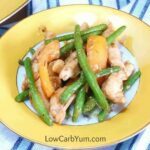 If you aren’t much of a cook, you’ll love the simplicity of this low carb chicken green bean stir fry dish. You only need to have basic cooking skills. 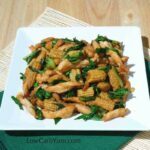 In fact, I made a lot of these stir fry dishes when I was living on my own in an off-campus apartment while in college. And, I was pretty clueless when it came to cooking back in those days. A lot people think that cooking is time consuming. But, it depends on what you are making. It’s so much healthier to make your own food at home. And, you save a lot versus going out to eat. I don’t really trust food at the restaurants. 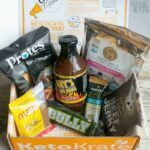 They often use convenience foods over fresh whole foods. You never know what you are going to get. 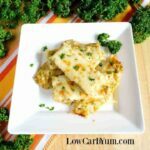 If you are looking for a few more easy skillet dishes to try on your low carb diet, I’ve several others on the site. 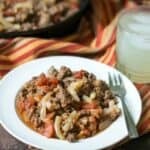 My Mexican Zucchini Beef recipe has been super popular. In the summer, I also like making my chicken squash skillet dish to use up our garden veggies. I hope you enjoy this as much as I did after a long day of work. What’s your favorite quick and easy dish for getting dinner on the table quickly? 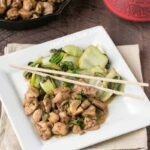 A wonderful chicken stir fry that cooks up fast in a skillet. 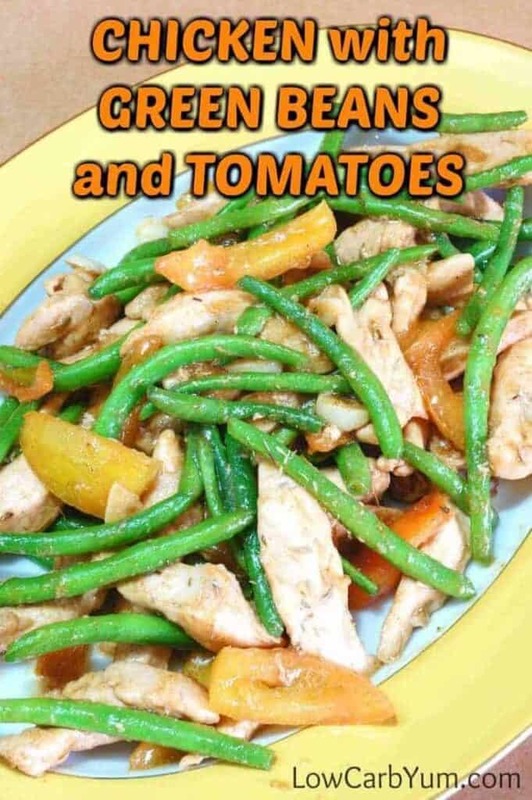 This chicken green beans and tomatoes dish makes a healthy low carb meal. 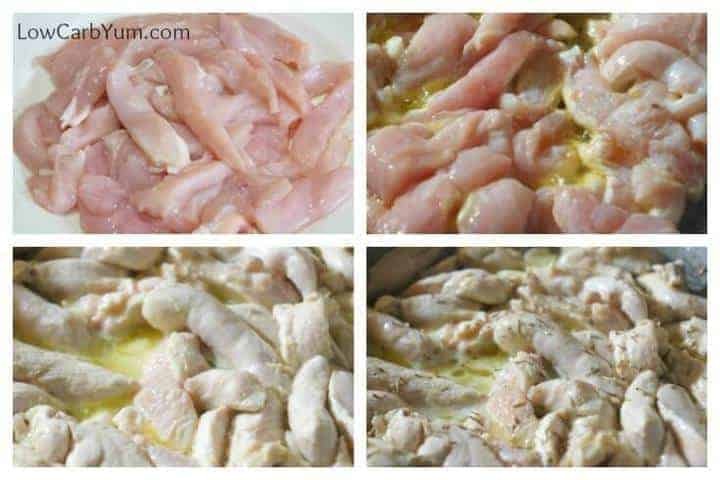 Cut chicken into thin slices. Melt butter in large skillet. Add chicken and garlic. Cook until all meat turns white. 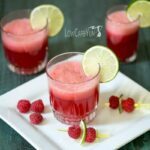 Add remaining ingredients and mix well. Cover and cook at low heat for 10-15 minutes. 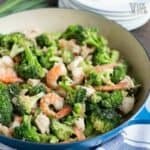 Love a good stir fry, this looks so delicious! Are canned diced tomatoes okay when garden tomatoes aren’t in season? And, would you use one can or two? Canned diced tomatoes could be used if you don’t have fresh. I’d use one can. You had me at “easy”! With three kids, if dinner isn’t easy, it’s just not going to happen!